Last Sunday, I experienced one of the best multicultural events in Toronto. It had food, dances, and exemplary cooperation. 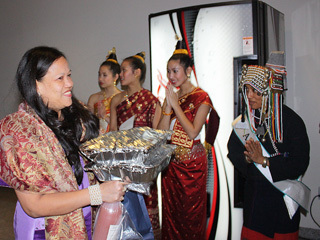 It was extremely well organized and it was free, yes free — if you brought a dish and wore national dress. Don’t ask me how the rest of Toronto can participate in this amazing event. You can’t unless you are connected to one of the twenty-plus member groups belonging to the Canadian Multicultural Council Asians in Ontario like the Thai Society or the Malaysian Association. But you can create your own such banquet. Have you ever invited a group of your friends of different cultural backgrounds to an international potluck in your home? The organizers of last evening’s soiree have been doing this for several years. They started, said Solayman Malikyar of the Afghan Association, with 200 people the first year. Now it’s up to 500. Each organization books a table or tables. The room at Scarborough’s Chinese Cultural Centre was the perfect size. The speeches were short. People went up to the two long buffet tables two table groups at a time. They didn’t have to stand in a queue too long. A congenial emcee kept things moving. The nationalities of the dishes were labelled and some, like those from Myanmar, gave a list of ingredients. Servers from each group helped the diners. A barbecued pig, head and all, Chinese style, was at each buffet table, and no one seemed to object. You could choose from the likes of pad thai, Lao beef, and Indian curry, and many kinds of noodles and rice. The variety of flavours was amazing and wonderful. Not everybody wore national dress, but enough did to make a heart-warming sight. 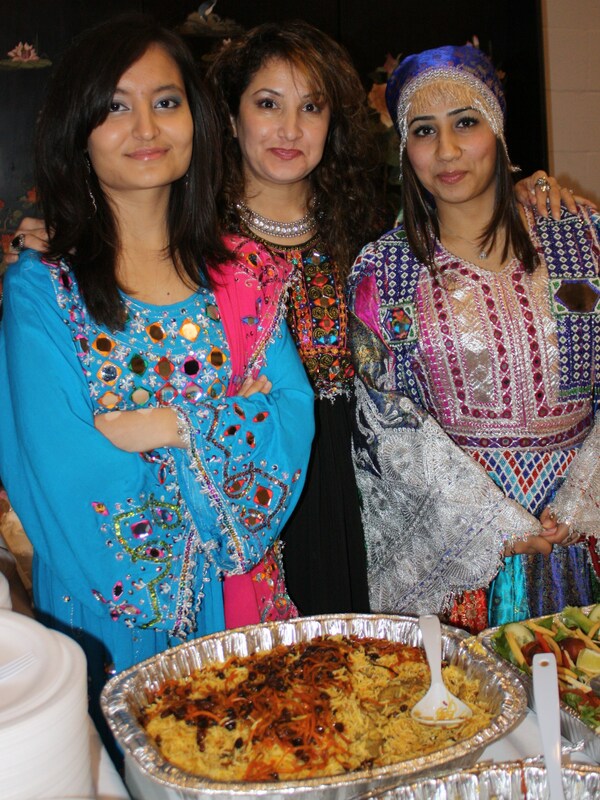 I was especially taken by the embroidered Afghan costumes, It was wonderful that some of the non-Asians there – spouses of Asians mostly it seemed – wore national dress of other countries, among them North African and Nigerian. 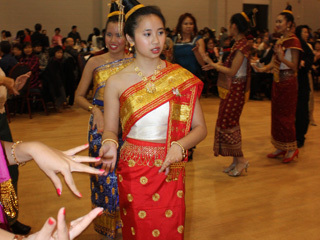 The dancers of course wore their own distinctive costumes. Unfortunately I had to leave early. I missed out on most of them but I did see people in Japanese and Chinese attire up there dancing with the Laotians, trying their best to copy the graceful hand movements. And the young dancers from Bangladesh were wonderful. The atmosphere was friendly and lively but I wish there had been more visiting between tables of different groups. For more about the CMC, visit the web-site: www.cmcasians.com.